Save space, money and time with this Epson small-in-one, featuring individual inks, mobile printing and a large colour LCD screen. If you’re looking for a high-quality, cost-effective printer for the home, our XP-442 small-in-one is sure to tick all the boxes. Smart savings can be made with this printer, as you only ever replace the colour used. What’s more, it gives you plenty of choice as Epson Connect has lots of mobile printing options. You don’t even need a PC to print photos; just insert a memory card into the slot. Be smart with your money and choose a printer that will continue to deliver great value. 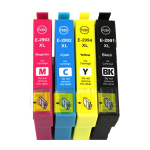 The XP-442 uses individual inks, so you only replace the colour used, saving on costs. There’s no compromise either; it’s designed to produce crisp, clear text and glossy, lab-quality photos. Simply slot in a memory card and use the large 6.8cm colour LCD screen and helpful menu prompts to print your photos without a PC.